Where Gentlemen may likewise be accommodated with Real-Toned Irish Pipes. The work, although undated, was published about 1797-1800. Years of search and inquiry for this extremely rare volume, with the assistance of Irish and English book agencies, proved futile, and it was eventually through the never-failing kindness and courtesy of W. H. Grattan Flood, Mus. Doc., Organist of Enniscorthy Cathedral; authot of “A History of Irish Music” and “The Story of the Harp,” that we have come into possession of a literal transcript of O'Farrell's Treatise, etc. ; from the original copy in Trinity College Library; and which is said to be the only one in Ireland. Perhaps not for its rarity and novelty, so much as for its practical value, will it be appreciated by those for whom it will fill a long felt want; nor will it, we trust, be found devoid of interest to the many who still cherish at least a sentimental regard for the Folk Music of the Olden Time. Being an instrument now so much improved as renders it able to play any kind of Music, and with the additional accompanyments which belong to it produce a variety of pleasing Harmony which forms as it were a little Band in itself. Gentlemen often expressing a desire to learn the Pipes have been prevented by not meeting with a proper Book of Instructions, which has induced the Author to write the following Treatise, which it is presumed with the favorite Collection of Tunes added thereto will be acceptable to the Lovers of Ancient and Pastoral Music. The first thing to be observ'd in learning the Instruement is the fixing it to the Body, so as to give it wind, which is done as follows. There is a small Pipe fasten'd to the Bag, the top of which is to be fix'd in the Mouth of the Bellows, so as to convey the wind freely to the Bag; there are also two ribbans or strings fastened to the bellows, the longest of which is tyed round the Body so as to keep the bellows steady: the other ribband is brought over the arm and fasten'd to the small end of the bellows. When done the Learner may begin to blow by moving the arm to which the bellows is nxed `up and down easy and regular, until the Bag is full of wind, which must then be fixed under the opposite Arm, and press’d so as to produce the tone. The Learner may at the same time stop the upper part of the Chanter with that hand where the Bag rests, by placing the tops of the fingers on the holes, keeping the bag well secured with one arm, and blowing constant and steady with the other, which when the Learner finds he can continue to do with ease for a few minutes, he may then proceed to stop the lower part of the chanter. But not with the tops of the fingers as the upper hand, it must be done by placing the little finger on the lower hole and the middle part of the other three fingers on the next holes, keeping the thumb behind to support the chanter. The Drones are not to be kept over the hand, but under so as to rest near the Body. The Learner then setting as upright as possible, having all the holes stopt begins to sound the first note D - which will produce a soft full tone as often as the chanter is well stopt. When Master of blowing and stoping the pipe you may proceed to the following Scale. At the same time I would advise the Learner to stop all the Drones for some days untill he can play a tune or two. The first thing to be observ’d in the above Scale is that the Notes of Music are placed on five parrelel Lines call’d a Stave. Each Note distinguished by its proper Name. Secondly the next table which has eight lines, on each of which there are a number of black and white dots, the black signifying such fingers as are to be stopt, and the white dots such as are to be raised. The high Notes or what are call’d pinch'd Notes on the pipes begin in E over which there is a mark thus ax to signify that the Bag must be press’d somewhat more than in sounding the other Notes. The Letter R is like wise fixed under the eight lines, to signify that the chanter must there rest on the knee, and for that purpose it would be requisite to provide a smal] piece of white leather to place on the knee, under the chanter as nothing else will stop the wind so well. The Learner may then begin to make the first note D by having all the holes perfectly stopt as may be seen by ob- serving so many black Dots on the Lines representing the eight holes of the chanter. 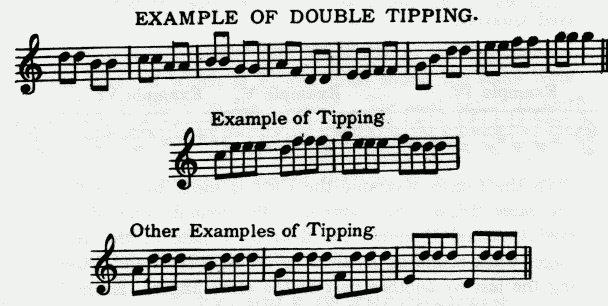 The next Note is E which is mark’d in the table with two white dots on the two lower lines, to Signify that the two lower fingers are to be rais’d together, while the chanter rests on the Knee. 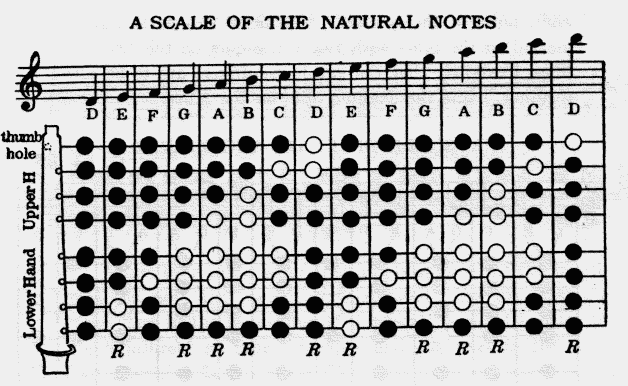 It is to be observed in this Scale that the Sharp of one Note is the Flat of the next above it for Example D Sharp and E Flat in the beginning of this Scale are both performed in the same manner, likewise G Sharp and A Flat and so of the rest. 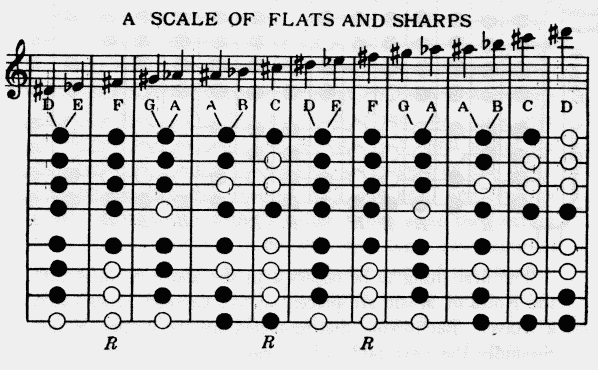 When Flats or Sharps are placed at the beginning of the Stave all the Notes on the Lines on which they are fixed are to be play’d Sharp or Flat unless contradicted by a Natural. A Sharp, mark’d thus ♯ before any Note, makes it half a tone Sharper or higher. A Flat, mark'd thus ♭ makes it half a tone lower, and a Natural mark’d thus ♮ reduces any Note made Flat Or Sharp to its primitive state. When Over Rests occur they imply silence for the length of the note they severally correspond. As for Example the Rest in the beginning of this Scale is equal in time to a Somibreve or four Crotchets and the next to the time of a Minim &c.
There are two sorts of Time, viz. : Common and Triple. Common Time is known by any one of these Characters, call'd Time Moods C C or 2/4. The two first marks contain the value of a Semibreve or four Crotchets in each Bar, but 2/4 contains only a Minim or two Crotchets in a Bar. Likewise the first mark denotes the slowest sort of Common Time, the next a degree quicker, & last a brisk movement. Triple Time is known by any of the following figures 3/2, ¾, 3/8, 12/8, 9/4, 6/4 or 6/8, 9/8, and are all moods of Triple Time, the first denoting a Grave movement, the two next marks are usually prefixt to slow Airs and Minuets, and all the rest adapted for Jigg tunes and brisk Music. 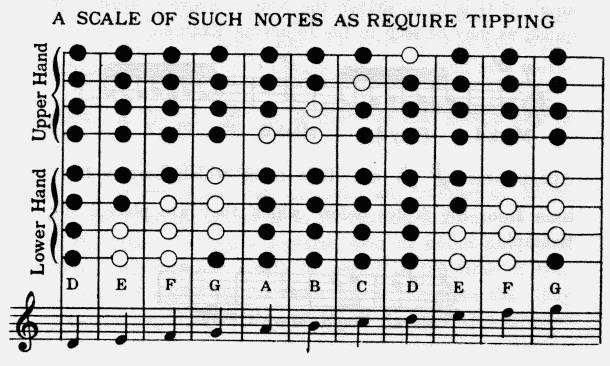 A dot following any Note thus makes it half as long again, that is a dotted Minim is equal to three Crotchets, a dotted Crotchet to three Quavers, and so of the others, a, dot following a Rest lengthens it in the same manner. A Single stroke or Bar thus drawn across the five lines divides the measure, and distinguishes one Bar from another. A Double Bar || divides the Airs and Songs into longer parts, and is always put at the End of a movement. A Repeat Signifies that such a part is to be play’d twice over. A Slur drawn over or under any number of Notes, signifies that the sound is to be continued from one note to the other. A figure 3 placed over or under any three Notes, imports they are to be play’d in the time of two. A figure 6 placed in the same manner signifies that they are to be play’d in the time of four. A Dot with a circular stroke thus signifies a pause or Rest on the Note over or under which it is placed. A Direct, thus is put at the end of a Stave to shew what Note begins the following. A Shake is an agitation or mixture of two sounds to- gether, which is performed by a quick motion of the finger, and is commonly mark’d thus tr over the Note that is to be shook. The first shake on this instrument is made on E, and as this shake is occasionally done two different ways on the same Note, I would advise the learner to be acquainted with both, it is sometimes done with the chanter resting on the Knee, having every finger stopt except the two lower ones, and at the same time beating quick with the first finger of the Lower hand - it may also be done with the chanter rais’d off the knee having every finger stopt except the one next the lower finger then by a quick beating of the first finger of the lower hand it is performed. A knowledge of this is very necessary to every person who is desirous of playing the Instrument perfect, so it ought to be studied as soon as the Pupil is well acquainted with the Gamut, and can blow and stop the chanter well. Curls are frequently introduced in Jigg tunes and Reels, and have a very pleasing effect in giving double harmony and Spirit to the Music, and therefore ought to be prac- tised at leisure. In the following Example may be seen some useful and popular Curls much practised. In the fourth Example the Curl is made by a patt of the same finger while sounding the second Note of the tyed Quavers, Example the fifth by a patt of the same finger while sounding D, slurring the next Note and finish- ing the last by another patt of the same finger. Example the sixth, the Curl is made by two quick patts of the upper linger of the lower hand while sounding the first Note F and finishing the next note D by a patt of the same finger. The third Note E in the same Example begins by two patts of the upper finger of the lower hand and finishes the next note D, with one patt of the lower finger of the upper hand. Most good performers at this time have only two Drones going at once, which are the two large ones. The large Drone must be stopt, then sounding lower A to the smaller Drone it may be screwed inward or outward till the sound is equal to A, then sounding the large Drone it may be screwed in the same manner till the sound of it is an exact Octave to the rest. The Regulator being one of the principle accompaniments to the Chanter, is used by most performers on this instrument and when managed with Judgment produces a very pleasing harmony, but I would not advise the learner to praetise the Regulator untill he could play a few tunes well. There are generally four Keys fixt to the Regulator - the lower of which is F, and must sound the same Note as low F Sharp on the Chanter. The next key is G and must be exactly in tune with low G on the Chanter. The next Key above that is A and is tuned to low A on the Chanter. The upper key of the four is B & is likewise tuned to B on the Chanter. The following Example will shew what Notes on the Chanter that each key of the Regulator will agree with. EXAMPLE OF THE CHANTER AND REGULATOR. It must be observed that it is with the wrist or Heel of the lower hand that each Key is touch’d, and care must be taken not to touch two keys at the same time. I would advise the pupil to begin the use of the Regulator by first sounding the Note low D, on the Chanter, to the low key F on the Regulator, which after a little practise will lead to a knowledge of the other Keys.